Urban barbecue tinkers with tradition, but it still shares time-honored cooking methods with its small-town brethren. Small towns own barbecue. In the nooks of North Carolina, there is more freedom to cook with wood. There is always enough parking, even if it means stashing your car along the side of the road. In the way that time in small towns seems to be elastic, there is no rush to eat. This is the routine in the barbecue towns of Lexington and Shelby and Reidsville and Dudley and Madison and, well, let’s not try to name them all, because we’d surely leave out your favorite. Sure, the big cities have had their share of renowned barbecue joints, too. But a new era of urban ’cue is wafting through Durham, Charlotte, and other metropolitan areas like hickory smoke from a pig cooker. Although the restaurant Picnic technically lies inside Durham’s city limits, it stands apart from the downtown culinary scene. In fact, it’s five miles away, nearly in the country, in a humble white building that used to house a convenience store on Cole Mill Road, a winding, wooded drive that shuttles people from Interstate 85 to one of the area’s many churches or to Eno River State Park. Picnic co-owner Wyatt Dickson’s love for barbecue was fostered by attending political fund-raisers —his mother was a state legislator, his father, a judge. 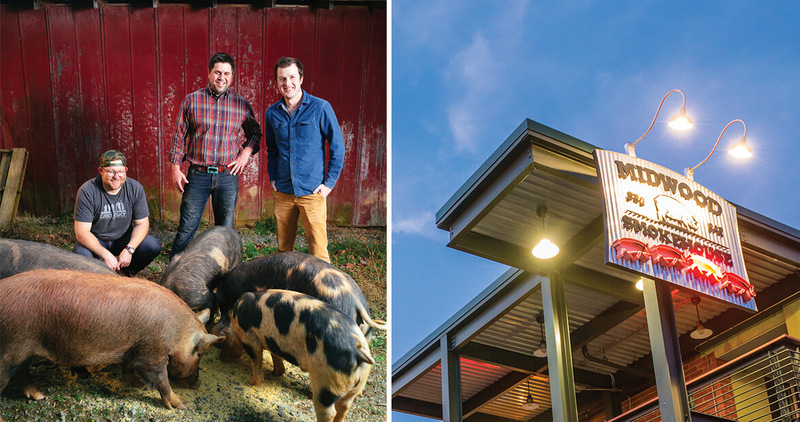 Dickson’s business partners come from traditional culinary backgrounds: Ryan Butler co-owns Green Button Farm, which raises heritage pigs in Bahama; Ben Adams is a former chef at the popular downtown Durham restaurant Piedmont, and a veteran of kitchens around the world. Dickson remembers barbecue’s glory days, when, as a child, he hung around the cooker at pig-pickin’s. That experience stuck with him, even in college, and later, as he planned to become a lawyer. As an undergraduate, he cooked his first whole hog for his fraternity. His local fame as a pig guy — lesser folks would take “pig guy” as an insult, but Dickson understands his home state well enough to know it’s a compliment — grew. Soon, Andrea Reusing of Chapel Hill’s well-known Lantern restaurant wanted to celebrate her restaurant’s 10th anniversary, and she hired Dickson to cook a pig for the event. By then, Dickson had enrolled in law school, and Reusing’s gathering happened around the same time that he was preparing for the bar exam. In the end, he decided to trade law for slaw. The world lost a lawyer and gained a barbecue man. To bring the classic, community pig-pickin’ feel to Picnic, Dickson plans to display a pig in a large glass window in the dining room. Elsewhere, in Charlotte, barbecue is a fairly new phenomenon. Restaurant owners spent some 20 years deciding if they wanted to join some of their hog-pickin’ neighbors. Then, Frank Scibelli, who already owned several restaurants in the area, had an epiphany: “Charlotte was woefully underserved when it came to barbecue,” he says. So he opened Midwood Smokehouse in 2011, doing his very best to take what he loved about barbecue — cooking with wood only, all the sides you would expect — and bringing it to the city. It turned out that urban dwellers couldn’t get enough. Midwood was so successful that Scibelli has now opened a second location in Charlotte. A third, in South Carolina, is on the way. Four Miles away, Will bigham sits at his Charlotte restaurant, The Improper Pig, which is traditional in the sense that it smokes its meat for up to 12 hours. However, Bigham holds a menu that includes both barbecue sandwiches and, yes, smoked tofu. He admits that some customers are skeptical of the barbecue-Asian fusion he’s created. But it’s Charlotte. Palates are different here. Back at Picnic in Durham, Dickson and Adams are refining their menu. Some of Adams’s international flair appears on the page, including confit leg of duck and chilled field pea salad.